How Can You Deal with Hopelessness as a Caregiver? ← Are You Forgetting These Important Protections When Caring for Your Mom? Homecare Arlington TN – How Can You Deal with Hopelessness as a Caregiver? Hopelessness is a terrible feeling to experience as a caregiver. You feel as if you’re at the end of your rope and there is no help in sight whatsoever. You can come back from that edge, but you may need to step out of your comfort zone to do it. Feelings like hopelessness continue to grow in silence. They become worse rather than better. Many caregivers worry that sharing these types of feelings with other family members and friends will go badly. This is why talking to other caregivers can be much more comfortable for you. 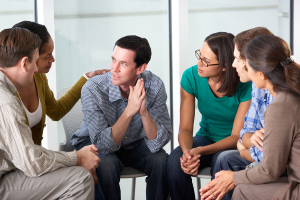 If you haven’t already joined a support group, now would be an excellent time to do so. The other caregivers in your group will understand how you’re feeling and be able to share what they’ve experienced as well. While it’s important to talk about your feelings with other people, it can be even more important to talk with someone who can offer you specific help designed just for you. This is where talking with a counselor or therapist with whom you’ve developed a relationship can help you to develop tools you can use to deal with how you’re feeling. They can also help you to determine when you might need even more help to deal with your situation. One problem that you want to avoid is unintentionally isolating yourself. It’s easy to do when you’re an overwhelmed family caregiver who is experiencing feelings of hopelessness. But the more you cut yourself off from other people, the worse the situation is going to become. You need to be reaching out at this time, even when it’s difficult to do. Start with baby steps and keep making them. In order to manage your feelings of hopelessness, you need to be able to focus on yourself some. You’ll need to be able to take some time just for you without worrying about what’s going on with your aging adult. Hiring homecare providers allows you to do what you need to do for yourself while still ensuring that your elderly family member is cared for properly. The sooner that you do something about the feelings you’re experiencing the less likelihood that they’ll affect your situation as a caregiver. Ignoring these types of feelings is not optimal at all. They’ll just continue to grow until they take over completely. For Homecare Services in Arlington TN, please contact the caring staff at Personal Care Services MidSouth today! This entry was posted in Homecare Arlington TN, Personal Care Tips and tagged Homecare Arlington TN. Bookmark the permalink.